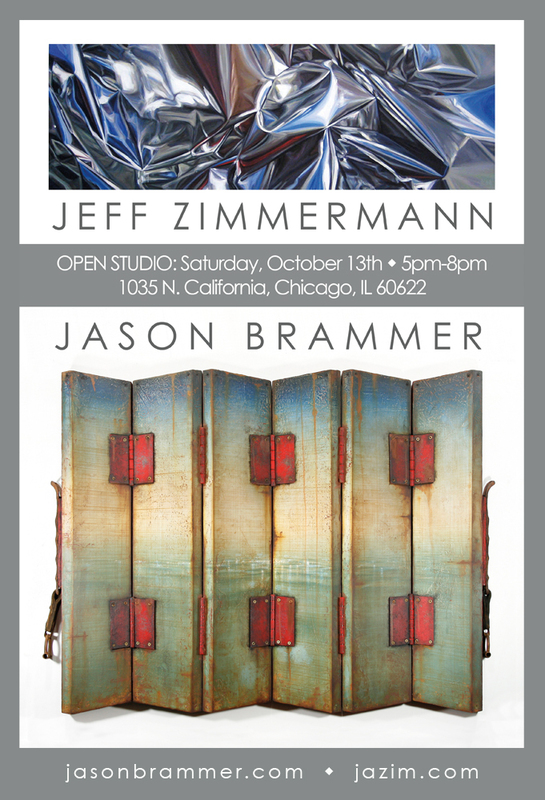 Artists Jason Brammer and Jeff Zimmermann have recently moved into a shared storefront studio in Chicago’s Humboldt Park neighborhood. Come see an exhibit of their work and help celebrate their new 3000 square-foot space at an open studio event on Saturday, October 13th. Both artists will be in attendance and the event is free and open to the public. Jeff Zimmermann has achieved national and international recognition for his large scale murals featuring painted images of contemporary pop culture and sensitively rendered portraits. Jason Brammer is known for his mixed media works that showcase a unique melding of paint and objects. Brammer seamlessly incorporates antique pulleys, vintage gauges, tubing, salvaged leather, and other 3-dimensional elements into his paintings, creating an illusion that draws the viewer in for a closer look to see what is real and what is painted. Chicago native Jeff Zimmermann has exhibited at numerous prestigious venues, including the Museum of Contemporary Art and the Chicago Cultural Center, and has created large-scale murals internationally. He’s produced commissioned artwork for clients that include Fortune 500 companies and the E.P.A, and has been featured on the Today Show and in the New York Times.